The struggle against the isolation may have stimulated the strong identification of the Finnish people with their municipality (kunta), although the identification with their nationality (kansalaisuus) be considered generally more important. One of the special features of the Nordic countries is their decentralized organization and thus the proximity of the government to the citizens. Indeed, the municipalities are the State, since they collect most of the tax revenues. Traditional institutes of the authoritarian state, such as the army, police and judiciary, are on a more distant level to the normal citizen in his everyday life. This strong phenomenon of identification seems to be present in the municipality of Korpilahti (Korpilahden kunta). 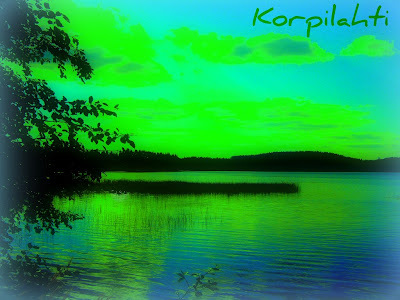 Located in the province of Western Finland and in the region of Central Finland (Keski-Suomi), Korpilahti has a population of approx. 5,000 inhabitants, and additionally approx. 4,500 inhabitants in the summer, when they visit their summer cottages (kesämökki). Under the developing reform of municipalities, on October 30 2006, a local referendum took place in Korpilahti. It was questioned the merger with other “neighbouring” municipality, the city of Jyväskylä (then, Jyväskylä, with its 83,582 inhabitants, didn’t have common borders with Korpilahti). The result was a “No” victory, with 52.0% (1055) of votes against the merger and 42.1% (1303) in favour. Later, on November 13 2006, the municipal council of Korpilahti (Korpilahden kunnanvaltuusto), counteracting the non-binding referendum outcome, decided in favour of the merger with the city of Jyväskylä, from January 1 2009 - 17 councillors voted in favour of the union, while 10 were opposed. The municipal government (kunnanhallitus) would have the task of preparing the accession to later approval of the council. On February 18 2008, the City of Jyväskylä, the rural municipality of Jyväskylä and the municipality of Korpilahti, by their respective municipal councils, decided that New Jyväskylä would be born on January 1 2009. New Jyväskylä will be the seventh Finnish largest municipality with a population of nearly 130,000 inhabitants, about half of the Central Finland region (Keski-Suomen maakunta) population and it represents an urban development pole of the “channel” New Äänekoski (Uusi Äänekoski) - New Jyväskylä (Uusi Jyväskylä) - New Jämsä (Uusi Jämsä). - Gigantic municipal service-providers pose the same problems of gigantic corporations monopolies: higher fares, lower service levels; lack of choice. - It is consensual “that some municipal functions are generally more efficient when they service larger numbers of urban residents ... It makes no sense for each municipality in the same metropolitan area to establish its own separate water-supply system. But this does not mean they all need to merge into one." In Finland, the municipal reform was subject of intense debate. A large number of small municipalities is seen as undesirable in public service provision and proposals were submitted for mergers imposed by the state. In the past, the ex-Minister for Regional and Municipal Affairs Hannes Manninen committee has proposed a municipal two-tier system, in which municipalities would have different powers. Otherwise, the Association of Finnish Local and Regional Authorities (Kuntaliitto) has supported a system with municipalities having at least 20,000-30,000 inhabitants. (current average is approx. 4,700). High levels of government efficiency strengthen the democratic legitimacy of governments. But also legitimacy allows greater efficiency. In the process of the municipal amalgamation nowadays taking place in Finland, it would be unthinkable that the final decision of the Finnish state would be contrary to the local popular will democratically expressed in municipalities where mergers had a “negative” referendum, especially since Finland is a signatory of the European Charter of Local Self-Government /Strasbourg, 15.X.1985. But then again the reality overcame the fiction. On 12 June 2008, in Helsinki, the Finnish government (Valtioneuvosto) took the extinction decision of the city of Jyväskylä (Jyväskylän kaupunki), rural Jyväskylä (Jyväskylän maalaiskunta) and Korpilahti (Korpilahden kunta), as well as the creation of the new municipality of Jyväskylä, on the current areas of the abolished authorities. Started in 2005, the Project to Restructure Municipalities and Services had the objective of creating a solid financial structure to assure the future organisation and provision of services supplied by the municipalities. Actually, Finland is in the implementation phase of the reform. In the next year - with municipal elections already realized - many new laws come into force. In previous years other reform phases passed, including the preparation of basic bills on legal reforms. During the period 2010-2011 will occur the execution of the legislation and the follow-up of the reform. On October 26, more than 10,000 municipal councillors were elected to local councils across Finland - one more decisive step of the municipal reform. The dominant issues of these municipal elections covered the restructuring of the public services of health care, education and child care. However, the electoral outcome is not expected to influence the center-right coalition government (Siini-Vihreä Koalitio) policy. The over 60% voter turnout in these local elections might have been caused by the electorate interest in the dozens of municipal mergers that will come into effect from the beginning of 2009. Electors of small merged communities, like Korpilahti, had keen interest to elect their representatives on the new expanded municipal councils. It is true that Finland's municipal elections, in general, represent well the principles of “grassroots” democracy. But not this time in the case of Jyväskylä October 26 elections - in fact, the new municipality will be founded on a democratic “deficit” from the beginning. And that will be the burden of responsibility of the new Jyväskylä council for the next four years. In reality, as a municipal autonomous institution, Korpilahti lost its self-government by extinction, in exchange for a few representatives on the new council and some promises of investments. Last Sunday, the traditional competition between the three big Finnish parties had a first-ever national win for the National Coalition Party (Kokoomus), but in New Jyväskylä the Social Democratic Party of Finland (Suomen Sosialidemokraattinen Puolue) is still the most voted. - The Size of Municipalities, Efficiency and Citizen Participation (Council of Europe, 1995). - Consolidation or Fragmentation: the Size of Local Governments in Central and Eastern Europe, edited by Pawel Swianiewicz, (LGI/OSI, 2002). Andrew Sancton, Globalization does not require amalgamation, Institute for Research on Public Policy - Montreal, Quebec. Davey, Kenneth; Division of reponsibility between levels of power, 2003. Project to restructure municipalities and services (Kunta- ja palvelurakenneuudistus), Ministry of the Finance, 2007. Good photo and interesting research work, Luis Hussein Alves.